New Delhi : With the rise in number of diabetics in India due to sedentary lifestyle, dentists have urged patients to take special care of oral hygiene as it has been found that the disease can trigger various oral infections. According to dentists, inflammation of gums, white and red patches and weakening of gums due to reduction of blood supply are among various oral problems caused by diabetes. “People with poorly controlled diabetes are at greater risk of dental problems. 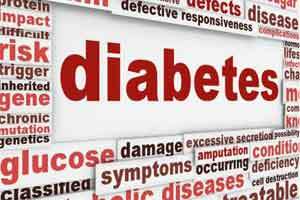 They are more likely to have infection in their gums and the bones that hold their teeth in place, because diabetes can reduce blood supply to the gums,” said Pradeep Gadge of Dr Gadge’s Diabetes Centre. Observing that high blood sugar may also cause dry mouth and make gum disease worse, Gadge said: “Less saliva can allow more tooth-decaying bacteria and plaque build-up. According to India’s dental statistics, one in three diabetics suffers from periodontitis at some stage of the disease. Rajat Dandewala, a city-based endocrinologist, said: “Diabetes patients are more prone to fungal infections such as thrush. “If a patient tends to have high blood glucose levels or if he is taking antibiotics often, he is even more likely to have this problem. Thrush leads to formation of white (or sometimes red) patches in areas of the mouth. “These can get sore or turn into ulcers. Thrush likes moist spots that may be chafed or sore, for example, under poorly fitting dentures (false teeth),” said Dandewala. Dentists have also emphasised that for children with diabetes, which is nowadays common, teeth may erupt at an earlier age and will hardly be strong enough.